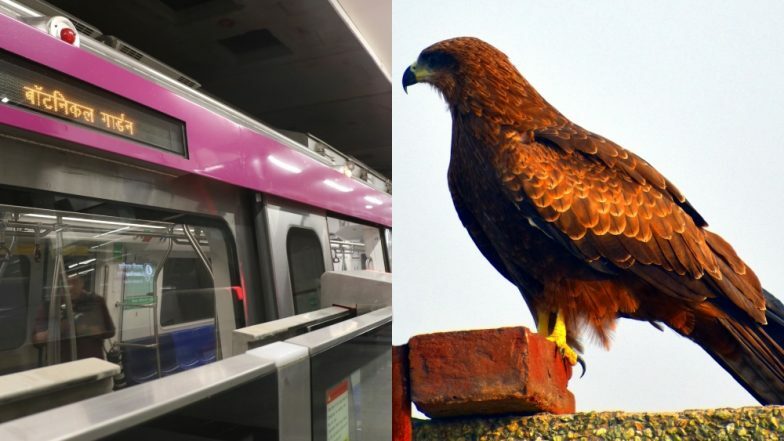 New Delhi, April 11: Services on Delhi Metro's Magenta line were temporarily halted after a bird fell on the train tracks. The bird is now safe, officials said. On Wednesday night, the Black Kite bird, which was later found to be exhausted and dehydrated, had a close brush with death after collapsing on the Metro tracks running between Botanical Gardens and Okhla Bird Sanctuary Metro Stations, non-profit Wildlife SOS said in a statement. Dead Parrot Photo From Kite Festival During Makar Sankranti 2019 Is Heartbreaking; See Viral Pic. Delhi Metro Rail Corporation (DMRC) officials said the incident took place around 9 p.m. and affected services on the Janakpuri West-Botanical Garden line for about 30 minutes. A rescue team from the NGO swung into action when a DMRC train operator saw the bird stranded on the tracks.